My ninth great grandfather was THOMAS BOYDEN (1613-1682). Tonight I discovered some of the details of his journey to New England using a combination of research on Ancestry.com and the Internet. Using the Ancestry database “Passenger and Immigration Lists Index,1500s-1900s,” (1) I located his name. This record gave me an annotation that referenced The Pioneers of Massachusetts by Charles Henry Pope. Ancestry also had a database for this publication. In the "Pioneers of Massachusetts" database (2), I learned that Thomas Boyden came to this country on the Francis of Ipswich. When I put the phrase “Francis of Ipswich passenger list” into Google, I got numerous hits. One of the best search results was entitled “Passengers of the Francis” by the Winthrop Society (3). On this website I learned that the Francis sailed from Ipswich, Suffolk, England in April of 1634 under the guidance of Master John Cutting. The date of record is 12 November 1634. Apparently, the ship arrived safely in Massachusetts Bay although some of the passengers perished during the voyage and others never boarded the ship. Thomas was listed as 21 years of age. No wife is listed. He gave an oath of allegiance at Ipswich. On The Olive Tree Genealogy website, I also found a transcription of the passenger list for the Francis (4). 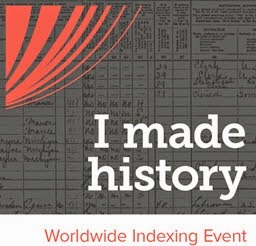 At the end of the list was a note by Robin L. Holden, Sr., web master for “JEFFCO Upstate NY Genealogical Research and the HOLDEN Surname, which declared that the passenger names “Just Houlding” and “Richard Houlding” were transcribed incorrectly and that the correct names were Richard and Justinian Holden. Suddenly a bell went off. The name Holden sounded familiar and, sure enough, I have a RICHARD HOLDEN in my family tree. The passenger list stated that he was 25. If the ship arrived in 1634, he would have been born around 1609—the exact date of the Richard Holden in my tree. Robin referenced a book entitled The Planters of the Commonwealth in Massachusetts, also an Ancestry.com database. (5) On "The Planters of the Commonwealth in Massachusetts, 1620-1640" database, I learned that Richard Holden was from Lindsey, the County of Suffolk, and that he arrived in 1634. My Richard Holden was also from Lindsey. So it appears that I may have had at least two passengers on this ship. As always, further research is necessary, but it was an exciting night! (1) Gale Research. "Passenger and Immigration Lists Index, 1500s-1900s" [database on-line]. Provo, UT, USA: Ancestry.com Operations, Inc, 2010. Original data: Filby, P. William, ed. Passenger and Immigration Lists Index, 1500s-1900s. Farmington Hills, MI, USA: Gale Research, 2010. (http://search.ancestry.com: accessed October 15, 2012), entry for Thomas Boyden. (2) "The Pioneers of Massachusetts (1620-1650)" database, (http://search.ancestry.com: accessed October 15, 2012), entry for Boyden, citing The Pioneers of Massachusetts, a Descriptive List, Drawn from the Records of the Colonies, Towns and Churches, and Other Contemporaneous Documents by Charles Henry Pope, Boston, Massachusetts, Genealogical Publishing Co., Inc., 1900, reprinted Baltimore, Maryland, Genealogical Publishing Co., Inc., 1998, p. 61. (3) “Passengers of the Francis” by the Winthrop Society (http://www.winthropsociety.com/ships/francis.htm: accessed October 15, 2012). (4) "The Francis 1634 England to New England," The Olive Tree Genealogy, 2012 (http://www.olivetreegenealogy.com/ships/francis1634.shtml: accessed October 15, 2012). (5) "The Planters of the Commonwealth in Massachusetts, 1620-1640" database, (http://search.ancestry.com: accessed October 15, 2012), entries for Richard Holden and Justinian Holden, citing The Planters of the Commonwealth , Part I, A Study of Emigration to New England In Colonial Times, p. 122. Thanks, Jim. It really is a fun hobby. It is like being on a treasure hunt every day. That's a good way to put it. Have you ever seen signed documents from the passengers on this ship? I'd love to see something that a more tangible. Karin, Richard Holden that came on the Francis in 1634 is my 8th G Grandfather. Thank you for the info you have here on your site. Karin, we are long lost relatives! Thomas Boyden Sr. is my direct ancestor 10 generations back through my mother and the main man in the genealogy book "Thomas Boyden and His Descendants" (printed in Boston in 1901 by Wallace C. Boyden et al.). Thank you for links here and info about variations on "Houghton." I've gotten back to the 1200s--crazy! Thank you. I love connecting with cousins. I have a copy of the Boyden book. Hi Karen, I believe Thomas Boyden is my 9th great grandfather also. I'll have to go back and count to be sure. I have a "copy" of the Boyden book also, which my mother copied from one of the originals, which was my uncle's, John Edward Boyden. This is interesting about the ship. I cannot imagine what those passengers went through. I wonder if your ancestor Holden knew our ancestor Boyden. Holden was 4 years older. I don't know how big Ipswich was (or is now for that matter). Thanks for your comments. Yes, our ancestors were very strong individuals. I doubt that many people nowadays could tolerate the ship voyages of the 1600s.